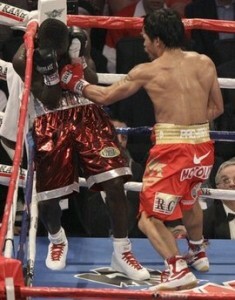 Fighting on the star, Manny Pacquiao showed once again why he is such a star. With the biggest fight crowd in the U.S. in 17 years cheering him on at Cowboys Stadium, Pacquiao dominated a strangely passive Joshua Clottey from the opening bell Saturday night to retain his welterweight title and cement his status as the best pound-for-pound fighter in the world. The fight wasn’t close, and it was never in doubt. It was so one-sided that even those in the cheap seats among the crowd of 50,994 could tell without looking at the giant video screens over the ring that Pacquiao was in total command. One ringside judge gave Pacquiao every round, while the two others gave him all but one. The Associated Press scored it a shutout for the Filipino sensation. It wasn’t as flashy as his knockout of Ricky Hatton or as savage as the beating he gave Oscar De La Hoya, but there was no doubt Pacquiao was in command the entire way against a fighter who kept his gloves up high in front of his face and chose to engage him only in spurts. Clottey’s strategy worked to keep him upright, but he was never competitive in the biggest fight of his career. I thought the De La Hoya fight was closer that last night’s. Will Pacquiao take on Floyd Mayweather next? I think Pacquiao will lose if he does.